New York, N.Y. I met Christopher Rim, the founder and president of an anti-bullying awareness organization called It Ends Today, about a year before Lady Gaga did. Enormously impressed that a high school student could be so savvy about organizing and branding — components necessary to create change no matter how well-intentioned you are — I knew Chris would make a large impact. 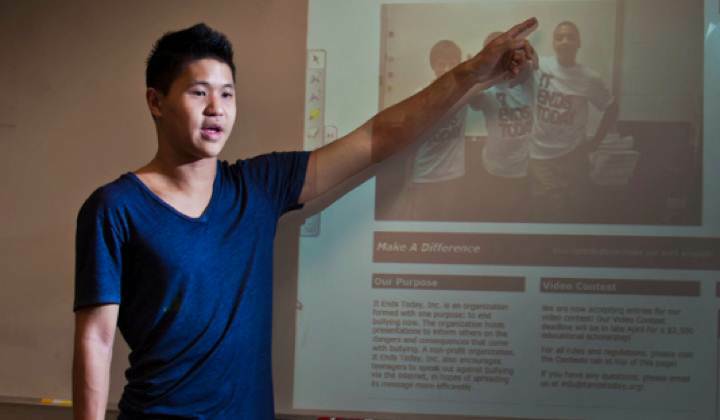 His group’s message is startlingly simple: Students listen more to their peers than adults. behind his anti-bullying network of organizations, It Ends Today. (Photo by Sergio Orlov)Through my friend and adviser Vlada von Shats, who advocates on behalf of the oppressed from Jews in her native Russian to students on the playground who get beat up for being different, I sat with Chris two years ago as he sketched out his vision of organizing students in public and private high schools across New Jersey to stand up to bullying. His approach reminded me of the union poster of many smaller fish forming into the outline of an enormous fish to eat the big fish stalking them. Brilliant. Of course, anti-bullying efforts are not new: My friend and mentor Peter Yarrow of Peter, Paul & Mary launched Operation Respect over a decade ago to use folk and rap music to combat bullying and is now operational in over 20 schools in six countries. Lady Gaga has also launched her own anti-bullying Born This Way Foundation. 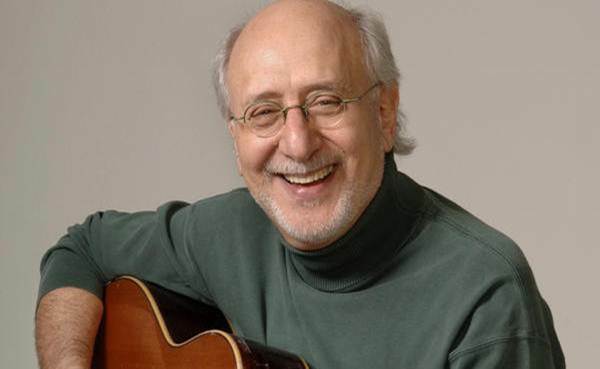 Peter Yarrow’s Operation Respect uses folk and rap music to combat bullying. (Photo courtesy of Operation Respect)Chris is closer to the playground. 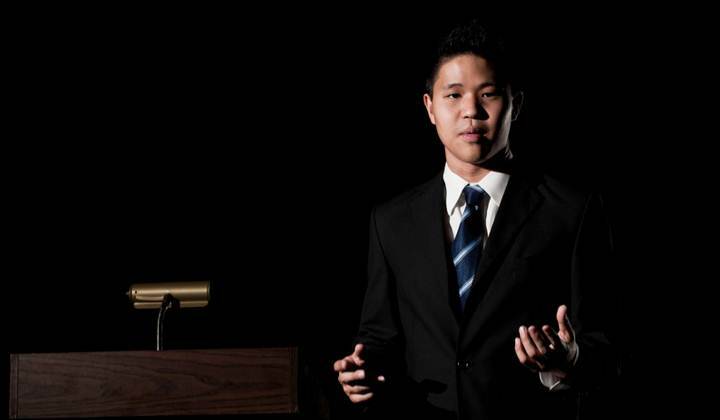 After successfully organizing over a dozen high school chapters in his home state, he has set his sights on Harvard, where he hopes to both matriculate and organize. I spent as much time organizing in college as studying — from gay rights to Japanese culture and Jewish awareness — so I know what it takes and he’s got it in spades. It Ends Today is unlike many other anti-bullying and motivational non-profit organizations. It is their belief that the most effective way to end bullying in our schools and community is for students to watch their own peers talking about problems and personal experiences related to bullying. 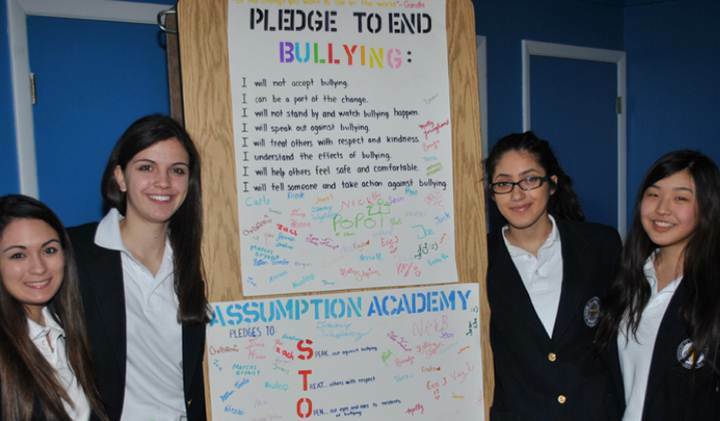 Holy Angels High School It Ends Today Chapter in Demarest, N.J. (Photo courtesy of It Ends Today)The organization believes that this kind of “peer-to-peer” action is more effective than having an adult dictate to children how they must behave. So far the organization has reached over 65,000 students in total in countries including the U.S., Canada, Switzerland, South Korea, Guam, Australia and Croatia. No two schools will ever see the exact presentation, because since each school has their own atmosphere, Christopher believes that each presentation should be custom to fit into the school’s environment so the message of anti-bullying can better connect to the students. organization’s website. (Photo by Sergio Orlov)When Christopher Rim was just 15 years old at the Academies@Englewood High School, in Englewood, N.J., he got tired of feeling powerless witnessing students being bullied, so It Ends Today was born. Christopher had also served as vice president of his school’s Student Council. Apart from his school community, he has served as the Community Director for the AIDS Walk New York 2012. Christopher is being noticed. He was honored with the President’s Lifetime Call to Service Volunteer Award from Barack Obama, was appointed a Luce Leader by The James Jay Dudley Foundation, and received the Best Buy Scholarship Award and the Dr. John Grieco Scholarship, as well as countless other awards from national, state and local government levels. When news articles about his anti-bullying organization appeared throughout the Tri-state area, Christopher was contacted by the Berkman Center at Harvard University to attend the launch of the Born This Way Foundation with Oprah Winfrey and Lady Gaga. This Foundation is supported in part by The MacArthur Foundation. He says it was one of the high points of his life. 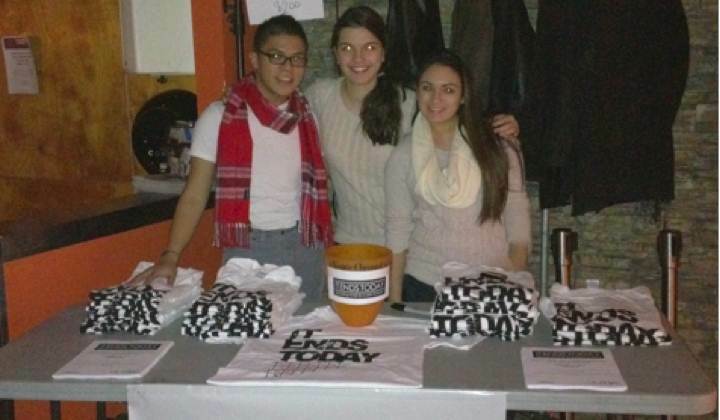 Volunteers selling t-shirts and spreading awareness about bullying at Vlada Lounge in New York City. (Photo courtesy of It Ends Today.The James Jay Dudley Luce Foundation supports young global leadership and our Luce Leaders embody that virtue. Only two talented and passionate teens were appointed Luce Leaders in 2012 and Christopher Rim, founder and president of It Ends Today, was one of them. One of my ancestors, Gov. Thomas Dudley, was a co-founder of Harvard almost 400 years ago, and my father Stanford L. Luce was a guest lecturer there. It would tickle me enormously to see Christopher apply his talents and insights to assist in tolerance-building in that astute Cambridge community. Meet Young Luce Leaders Christopher Rim and Isaac J. Kassin at the J. Luce Foundation’s 12th Annual Year-End Champagne Reception hosted this year by Skadden Arps.